Vanilla Cake Bars - Chocolate flavoured sponge with a vanilla flavour topping, covered with milk chocolate. 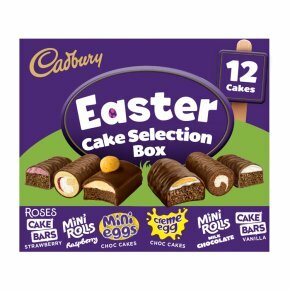 Mini Eggs Choc Cakes - Chocolate flavoured sponge with a vanilla flavour topping, covered in milk chocolate and decorated with a milk chocolate egg in a crisp sugar shell. Raspberry Mini Rolls - Golden sponge with plum and raspberry jam and a vanilla flavour filling, covered with milk chocolate. Milk Choc Mini Rolls - Chocolate flavoured sponge with a vanilla flavour filling, covered with milk chocolate. Orange Roses Cake Bars - Chocolate flavoured sponge with an orange flavour topping, covered with milk chocolate. Caramel Cakes - Chocolate flavoured sponge with a caramel topping, covered with milk chocolate and finished with a yellow decoration. Now with more cakes. Share the joy! Suitable for vegetarians.